Capt. Al Morris (left) and his son Al Morris, Jr. pose with the 100-pound swordfish. 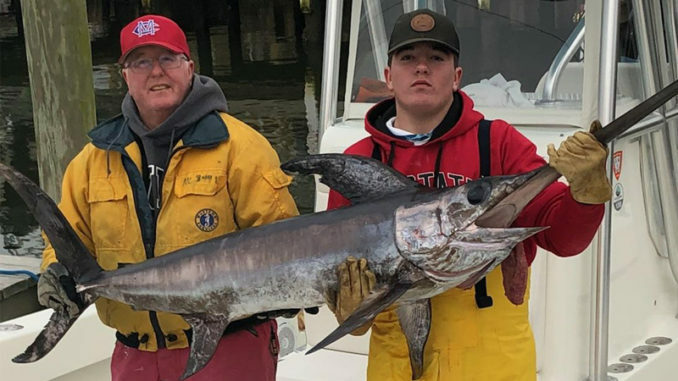 Fourteen-year-old Al Morris, Jr. of Atlantic Beach, N.C. was fishing with his dad Capt. Al Morris and friend Jackson Sproul last week when he landed his first swordfish. 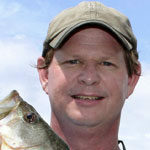 Morris, Jr. hooked the 100-pound fish while drifting about 65 miles out of Atlantic Beach. The crew was fishing in 1900 feet of water and hooked the fish at about the 1750-foot mark. 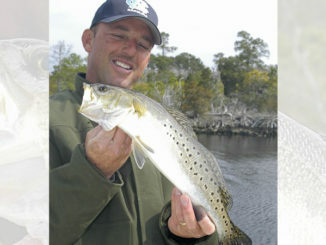 The young angler battled the fish for about an hour before hauling it aboard his dad’s 30-foot Privateer center console. He was using a 16-inch squid as bait on a 10/0 hook with a Shimano 9000 electric reel. Capt. Morris said his son was excited to get the fish onboard, especially since he and his friend hooked, fought, and lost a swordfish the previous week. They also hooked but lost another one on the same day Jr. caught the 100-pounder. Not many anglers catch swordfish this time of year, but Morris said the fish are definitely out there. “Not many people catch them at all really, no matter what time of year it is. I know they are catching some up out of Oregon Inlet at night lately. That’s a good time to go because the swordfish come up closer to the surface in the dark. You can catch them about 300 feet down at night. But I don’t have the right boat for that. And you can catch them during daylight. You just have to get down deeper. 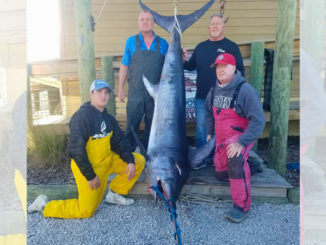 You want to be in water between 1500 and 1800 feet deep to catch one during the day,” said Morris, who runs Sea Drag’n Charters (252-269-1346) out of Atlantic Beach. Morris said that not many anglers fish for swordfish because it takes a lot of time and commitment. Most other anglers would rather fish for something else with the amount of time you spend targeting swordfish. 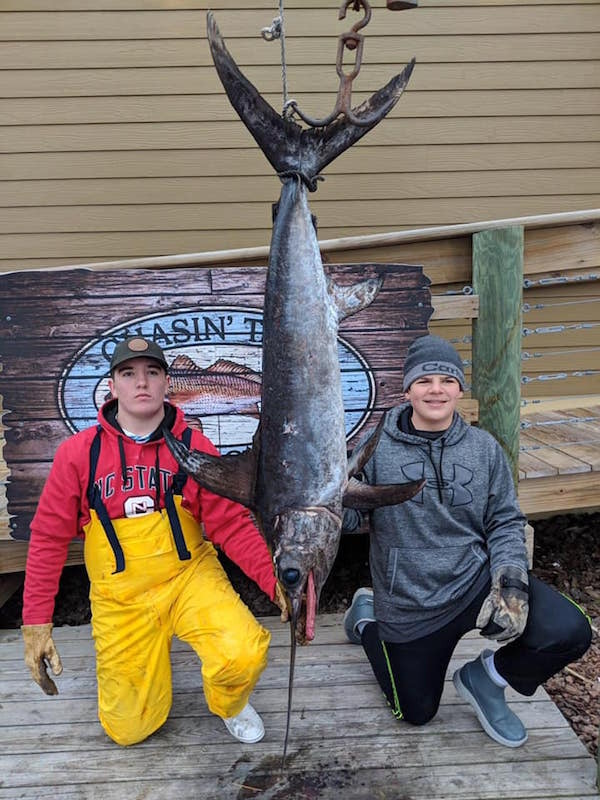 Al Morris, Jr. and Jackson Sproul, both 14-years-old, with Morris’ swordfish. “You have to commit to the whole day of swordfishing. There’s no trolling for wahoo or jigging for grouper or anything else during a swordfish trip. You’re using 1200 feet of line, a 300-foot leader, eight to 10 pounds of weight, and you’re dropping your bait in 1500 feet of water. It takes 20 minutes for it to get to the bottom. You’ve got strobe lights and diamond lights attached to the line. So between riding out there and getting all set up, it’s a lot of time,” he said. And once set up, Morris said you drift and wait. It’s not always easy to detect a bite, even from a big swordfish. “When your bait is that deep, your rod tip barely moves when a fish takes it. But as you reel it up, and especially that last 150 feet, man that’s something to see. These fish jump, thrash around; it’s really a battle. “The kids love it. Once you get set up and start drifting, it’s a waiting game. And you’ll catch fish, but not always a swordfish. We catch big sharks, big grouper. 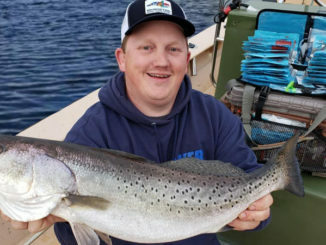 You drop a 16-inch squid on the bottom in that kind of depth, and something’s going to bite it,” he said.